So, let’s talk about some Rock Tape products. If you are an athlete and have a race coming up, you need that extra support and faster recovery, Rock Tape might be able to help you out. The most common sports that use these products are running, triathlon, and crossfit. Rock Tape and Rock Sauce combined can be applied to injuries of all kinds. Some of the more common injuries include: ankle sprain, wrist pain, shoulder pain, neck pain, low back pain, IT Band, knee pain, hamstring, and hip pain. Rock Tape is a special kind of tape known as kinesiology tape (KT tape). While we can’t turn a 5 hour marathoner into a 3 hour runner, we do have methods to help you break the 3 hour barrier if you’re already close. When applied properly, Rocktape can help athletes improve form and decrease fatigue through better blood flow. RockTape works by stretching in one direction and not the other. This creates a bio-mechanical lifting mechanism that lifts the skin away from the soft tissue underneath, which allows more blood to move into an injured area to accelerate healing and recovery. Rock Sauce is the only topical pain reliever designed to work with kinesiology tape. It can be applied directly to the surface of Rocktape. Rock Sauce is a heat based lotion for Isolated muscle pain and joint soreness, Graston, and ART use. 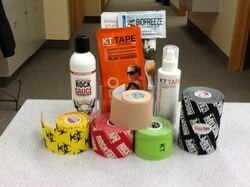 Dr. Tom Fletcher at Wasatch has these products available and is trained to apply them to injuries. So if you have a race like St George 70.3, Ogden Half Marathon, or Deer Creek Open Water Swim coming up and need to speed up recovery or injury recovery, come in and see us.